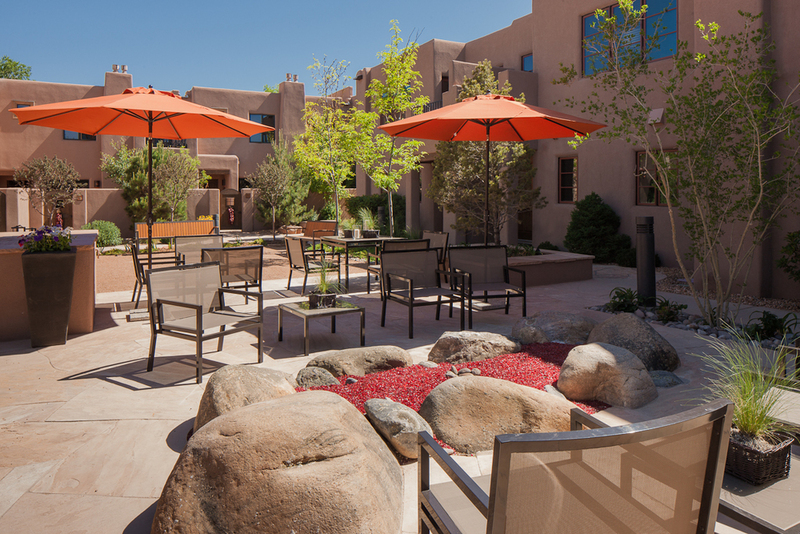 El Corazon de Santa Fe is a downtown fractional ownership property owned by Fairmont Hotels & Resorts. Through an extensive renovation to this already remarkable property, Fairmont expanded its clubhouse and developed a private park for enjoyment by the owners. Surroundings was commissioned by the client to design a 5,000 square foot park over an existing parking lot that would create an enhanced amenity for owners and guests. Elements of the park include a natural stone boulder fire pit with recycled glass, contemplative sitting areas, a boulder fountain, and an open event space that could be used flexibly for readings, small music venues, or private gatherings. Utilizing the previous surface drainage pattern from the parking lot, our team designed a ‘stormwater acequia’ that created a stone lined channel through the park; this expression of the water cutting through the park resulted in varying levels within the park as well as elegant flagstone bridges. Privacy for residents’ units was also addressed through the selection of plant material and its appropriate location to buffer between park and home.